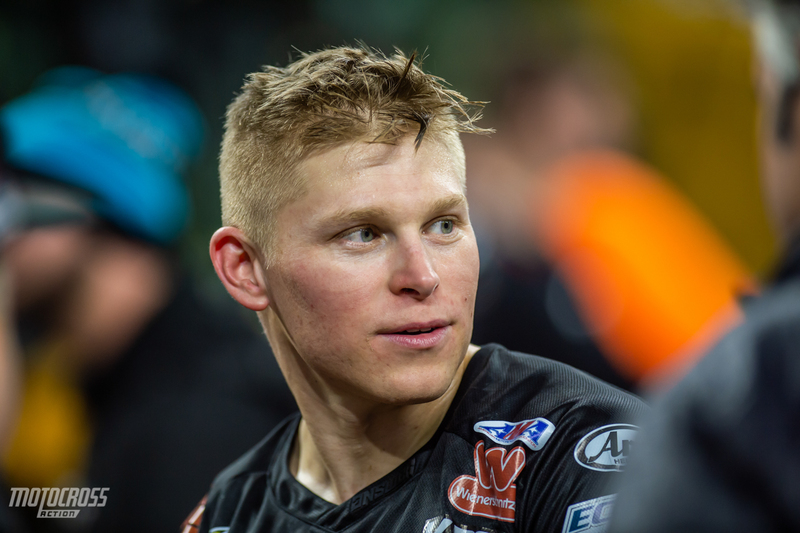 Alex Martin has been fast all year, but he hasn’t been able to put it together for a podium yet. 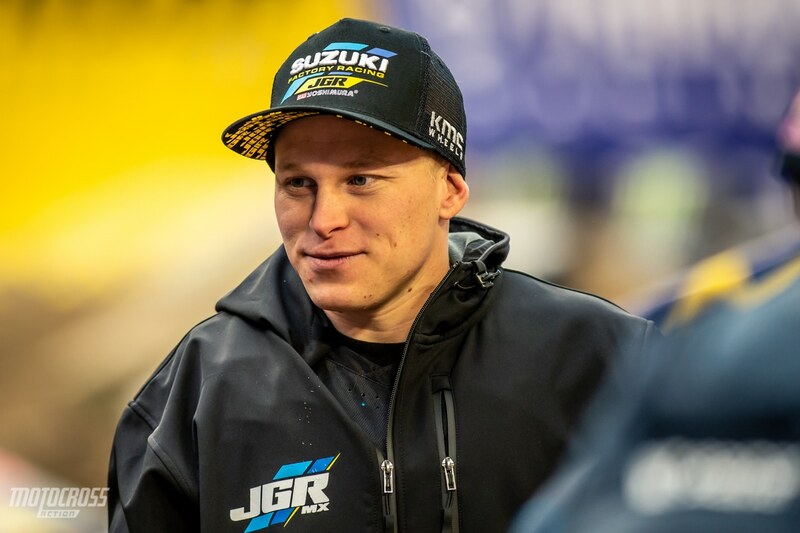 A new team, and a totally new bike were some significant changes for the Minnesota native Alex Martin. Known for his work ethic, along with desire and determination, Martin was a great signing for JGR Suzuki. 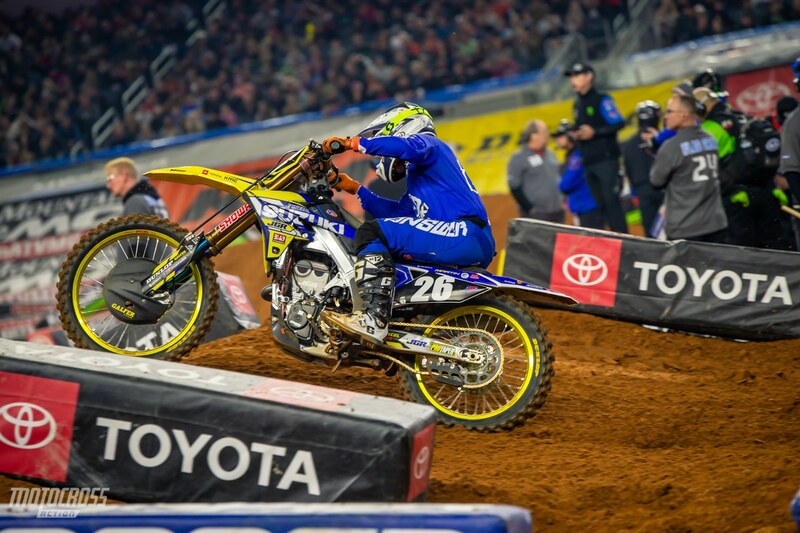 Currently, his best main event finish is a fourth, and he’s also sitting fourth in the 2019 250 East Coast Supercross point standings. With the being said, Alex is very determined to finish out his Supercross season with a podium. We caught up with Alex recently to learn more. ALEX, WHAT IS YOUR TAKE ON HOW YOUR SEASON HAS BEEN? All in all, so far it has been a solid season. I will say that we were really, really close to getting the podium, one lap away at Minneapolis. After the last few years of being hurt, on the couch, and not even being able to race, it was nice to be out there racing again. But now it’s getting to the point where we have been top 5 often, but I really want to get that podium, and I just want to be up front. I have been struggling with my starts, so we have been working a lot on the starts to get up front and give myself a chance. But all in all, I am happy with the season so far, but definitely looking for better results going forward. 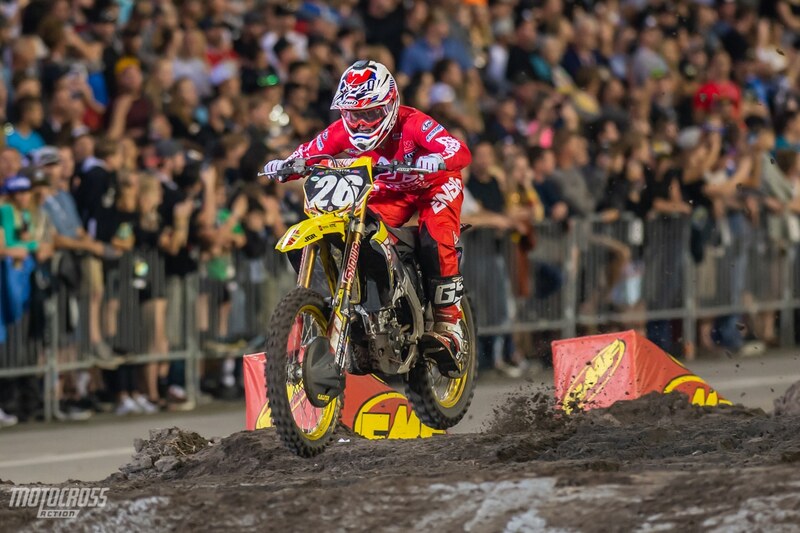 Alex Martin throws some style on his way to a 5th place finish at the Daytona Supercross. WITH THE COMPETITION NOWADAYS, STARTS SEEM TO BE EVEN MORE IMPORTANT. Oh, for sure. I think we are all pretty closely matched in speed, but it takes a start. You have to be up front. Supercross has always been that way. Starts are always very critical, but this year, especially, it seems like we have a pretty stiff 250 East Coast class in terms of competition. So yes, I can say we have been working a lot on starts. We tried some different settings this week to hopefully help keep the front end down for me a little bit better. 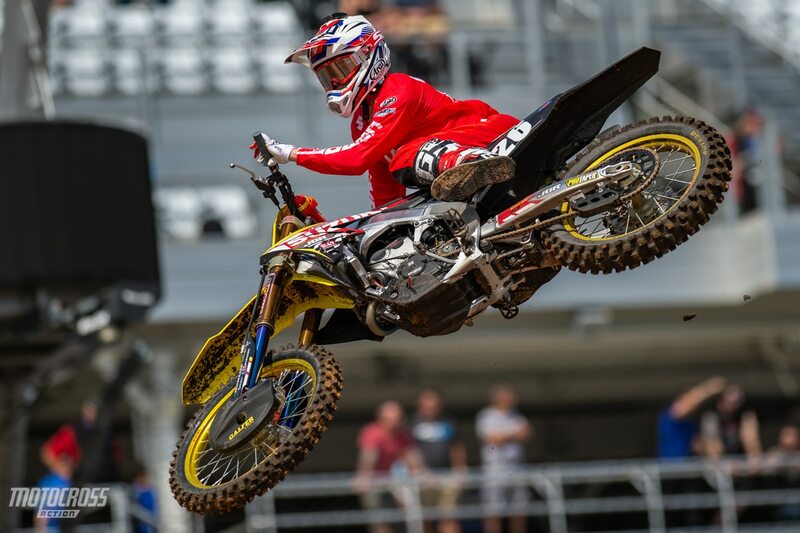 IT SEEMS LIKE THE JGR SUZUKI IS CERTAINLY CAPABLE OF GETTING A START AS WE’VE SEEN YOUR TEAMMATE, KYLE PETERS UP FRONT ON THE START MULTIPLE TIMES. One thing that is exciting with the team and the Suzuki, is that it’s plenty competitive. Maybe there was some questions about the power of the bike, but this year, I think the bike is great. 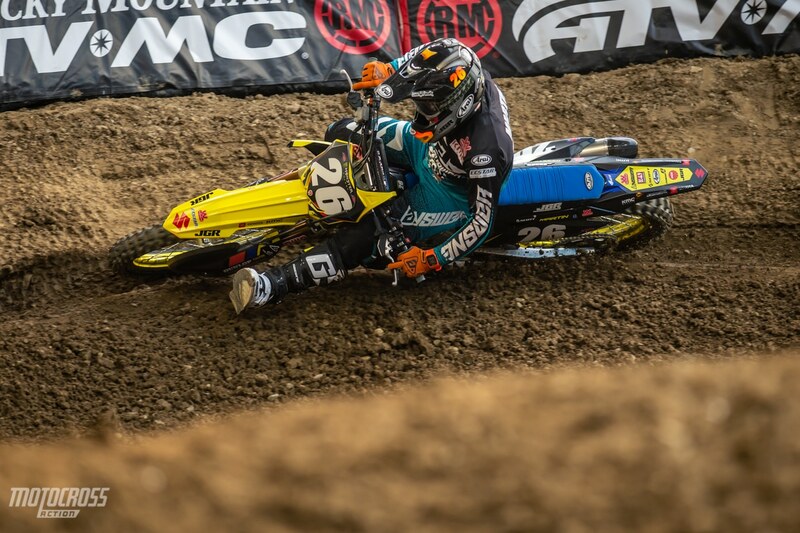 I think Kyle Peters has had two holeshots; at Dallas and then he holeshot at Daytona. That shows the bike has power to get a holeshot, and it is definitely competitive. I am happy with the engine that they have been able to provide for us. It just really comes down to me figuring it out and getting a start, but it was cool to see K.P. up there for a couple of laps at Daytona. It would have been nice if that were me, I could of maybe went for a podium. 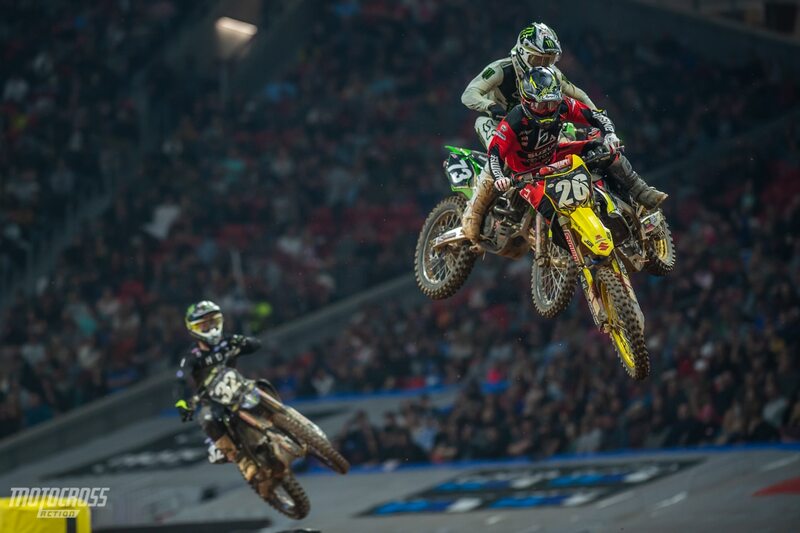 Alex shares airspace with Martin Davalos and Justin Cooper in Atlanta. IT’S INTERESTING TO ME THAT THE GUYS AT JGR MUST HAVE A LOT OF OPPORTUNITY TO FURTHER DEVELOP AND IMPROVE THE BIKE. THERE IS NO MORE SUZUKI MXGP EFFORT THAT CAN HELP WITH THE BIKE. It has been awesome working with JGR. They have been really nice, and they have a lot of resources at their disposal. With the Nascar shop being just down the road from the Motocross shop, they are able to really make a lot of parts, go whatever direction the rider needs to go, and it is nice to have that at your disposal. Engine wise, like I said, they have Dean Baker and all the other guys that have been working hard and trying to get as much as horsepower as they can. Honestly, they have given us a really good package. As I said, I think it is competitive. There are so many other factors that play, but I think for us during the Outdoors, it is really going to be a benefit to have all those resources in your pocket. Alex Martin leans into a Minneapolis rut. It has been awesome to watch Alex rail corners on his Suzuki 250 this year. You can tell he is confident in his bike when he gets this low in almost every corner. YOU HAVE ALWAYS DONE WELL BOTH INDOORS AND OUTDOORS, BUT I WOULD MAYBE SAY THAT OUTDOORS PLAYS MORE TO YOUR STRENGTHS. Yes, after Indianapolis, the 6th round, we had a couple of weekends off before Nashville on April 6th. I was into riding Outdoors already, got some motos under my belt, and got a feel for the setting. I’ll probably go up and test a little bit more, because really, we just have Nashville, New Jersey, and Vegas. Hangtown will be here before you know it. Coming into this year, the focus was to be healthy and to show that I can be competitive, and go for wins and podiums in Supercross and also outdoors. I do feel that I am a good Supercross rider, and Supercross definitely does not come to me as easy as outdoors, but I do feel that I can be competitive and go for those wins and podiums in Supercross too. After two years of riding for the Troy Lee Designs Red Bull KTM team, Alex moved to the JGR Suzuki team and he signed a two-year contract with them. ARE YOU STILL LIVING IN FLORIDA AND TRAINING WITH THE SAME GROUP OF GUYS AS BEFORE? Yes, my wife and I bought a house in Clermont, Florida at the end of September 2017 and the last two years, I trained at Baker’s Factory. Now I am training at the Moto Sandbox, and I have John Wessling, who writes the program for me. I do a lot of the riding and training off the bike with Ken Roczen, Chase Sexton, and Adam Cianciarulo when he is here. He is in California a lot but it has been a fun group and a fun atmosphere. We have fun, but we also get the work in and we work hard. With the move to JGR, Alex also had to switch up his training program. In 2017-18, Alex did all of his training at the Baker’s Factory. But with the Baker’s factory being a KTM and Husqvarna only training facility, Alex had to figure out where to go next. YOU HAVE BEEN DOING IT ENOUGH THAT YOU PROBABLY KNOW WHAT YOU NEED TO DO AND DON’T NEED AS MUCH HELP. Yes, I do enjoy my program now. I have a little more freedom, and I can actually work on my weaknesses instead of just going with the status quo, and that is good for me. I have been able to work on my weaknesses. I have been at it for a long time, and I know what I need to work on. At this stage in the game too, everyone is training. No one is in our sport is successful off of pure talent anymore. We are all training, we are all doing our motos during the week, doing our bike riding, doing the gym work, so there is no real secret formula. It is good to just do the work, then just go home at the end of the day and have fun. BEING IN FLORIDA, YOU ARE SOMEWHAT CLOSE TO THE JGR RACE HEADQUARTERS I WOULD IMAGINE. Yes, you are right. I spend quite a bit of time up in Charlotte in the off-season testing. Fortunately, we can get a pretty cheap flight from Florida up to Charlotte. It is only a one hour flight, so I was able to do that a lot. So, I can go up there, do some testing, and then come back and train and do motos down here in Florida. It has been nice, we can mix it up a little bit, and be here and there and bouncing back and forth. As I said, it is nice to go up to Charlotte and take advantage of all the resources that JGR has with the track, the shop, and all of that stuff. Known as one the most hard working riders in the 250 class, Alex is also very smart. He’s learned a lot about nutrition and training from his experiences with different coaches over the years and from studying on his own time. ALEX, YOU ARE ONE OF THE VETERANS ON THE 250 TEAM AND THE MOST ACCOMPLISHED AS FAR AS RESULTS AND FINISHES. DOES THE TEAM RELY ON YOU FOR MUCH OF THE TESTING, OR SETTINGS DEVELOPMENT? To be honest, even though Kyle Peters, Jimmy Decotis, and I are all pretty close in stature, they do not rely on me at all for settings. Jimmy D has a lot different suspension setting than I have. I rode with his setting for a little while and I did not like it, so I went a different direction. Engine wise, we are all very similar, we all chose the fastest package. Chassis wise, we are similar. Suspension wise, we all are a little bit different, and it’s something unique to each rider. 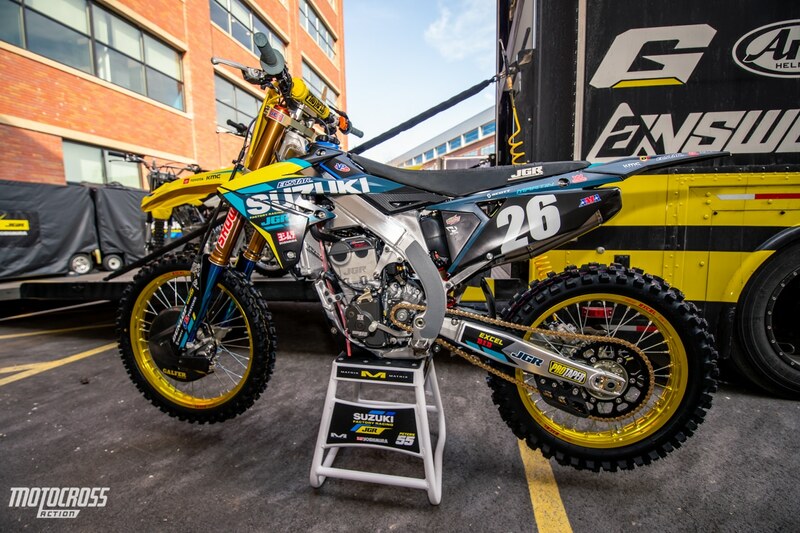 Up close on Alex Martin’s JGR Suzuki RM-Z250. AS A WRAP UP, HOW ARE YOU VIEWING THESE LAST COUPLE SUPERCROSS ROUNDS? I am definitely looking to make a statement in the last few rounds and be on the podium. As I stated, starts are going to be key. I just need to give myself a chance. I feel like my average starting position through the first five rounds has been around 7th, so it is kind of hard to get the job done when you are that far back. So that is the thing, I just need to give myself a chance, so we can be up front battling with those guys. That is where Austin Forkner has been super this year; with his starts. He just gets out front right away and runs away from the rest of us, so that is what I need to be doing.